Puerto de San Miguel has a broad sandy beach protected by the surrounding cliffs. A favourite for families and also popular with peace-seeking couples. Situated on the north coast of Ibiza, Puerto de San Miguel (Port de Sant Miquel in Catalan) was once the fishing port of San Miguel village, but is now a popular small resort with families and peace-seeking couples alike. Here can be found one of the most sheltered beaches on the island, nestled in a cove and surrounded by lush pine-covered cliffs. A good distance away from the hustle and bustle of the major resorts, Puerto de San Miguel is the ideal location for those seeking tranquillity and beauty in a holiday. There are some souvenir shops and a supermarket, and several bars and restaurants line the beach, including the Port Balansat - heralded by many as one of the best fish restaurants on the island. Locals come from all over the island to eat here, especially Bullit de Peix, the typical Ibicencan fish dish. Puerto de San Miguel boasts a beautifully sandy beach and clear, shallow waters. There are lots of water-sports, including waterskiing, windsurfing and a diving school and, of course, the usual sun beds and sunshades are available to rent. Visitors should definitely visit the interesting dripstone caves Cuevas Can Marça, just walk up the road on the right side of the bay, the effort will be rewarded with fantastic views. 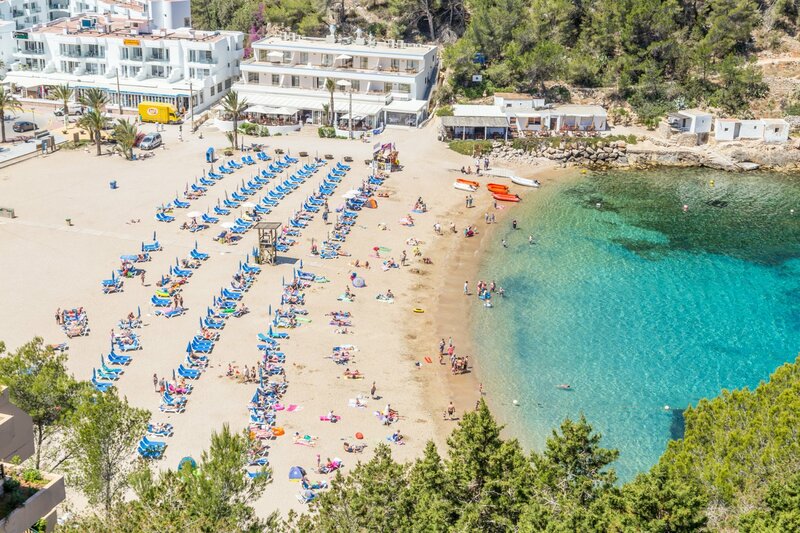 Puerto de San Miguel is well connected with the rest of the island, with a hired car and also buses it's only a short ride to Ibiza Town, Santa Eulalia and the hippy markets. Little ferries go to San Antonio, the resort Portinatx and also the hippy market in Es Caná, all well worth a daytime excursion. There are a number of hotels and apartment complexes lining the beach and built right into the cliffs, some of which were built in the early seventies, so whilst not always the most architecturally attractive, the stunning sea views from the accommodation more than make up for this. Only a short walk away in the surrounding green hills you'll find the Can Maries Country hotel - an oasis of calm with stunning views. Or have a look at the nearby holiday villas - living the dream as the VIPs and celebrities do on the island!